In light wind conditions it is important to set your sails up for maximum power. The backstay should be eased right off. This affects the rig in two significant ways:firstly, it allows the mast to straighten up fore and aft, which reduces pre-bend. This makes the mainsail a fuller and more powerful shape, and secondly, it eases tension on the forestay, this allows the forestay to sag off more which induces more fullness into the headsail. 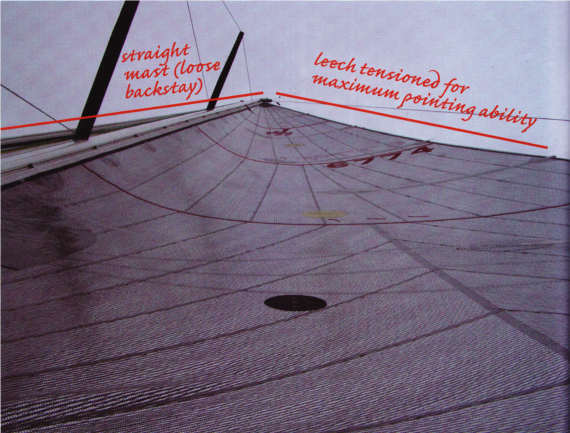 The luff tension on both sails should be eased so that they are quite relaxed, this allows the draft position (maximum fullness fore and aft) to set up in the designed position which is normally around 35% on the headsail and 40% on the main, depending on the type of the boat. Too much halyard tension in lighter winds will move the draft position in both sails too far forward which can considerably reduce your pointing ability. While we’re on the topic of adjusting the luff tension, it’s worth pointing out that mainsail luff tension can be controlled by easing or raising the halyard, but the far easier way is to rig the Cunningham. This is a common device on race boats that all cruising boats would benefit from using. This is good light weather trim. 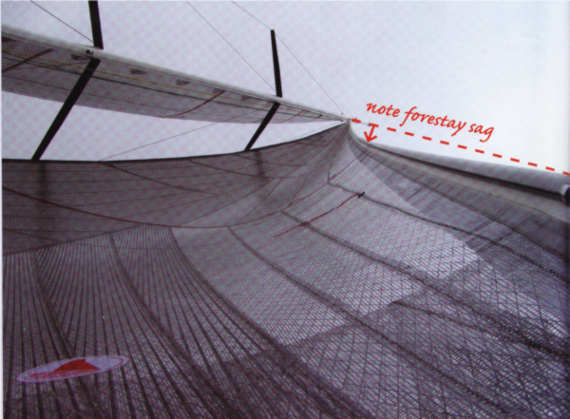 There is sag in the forestay to give the headsail a full, powerful shape. The mainsail is set for light winds. The loose backstay reduces the mast pre-bend, creating a powerful shape for maximum power. The leech is tensioned for maximum pointing ability.